Irritable bowel syndrome (IBS) is a chronic functional digestive disorder that affects about 10 percent of the world’s population and 10 to 15 percent of the general population in the United States, including women and men of all ages. According to the Canadian Digestive Health Foundation, IBS affects 18 percent of the population in Canada, one of the highest rates in the world. IBS mainly involves the large intestine (colon) and is characterized by cramping, recurrent abdominal pain, altered bowel habits, bloating, abdominal distention, excessive gas and flatulence, variations in stool characteristics, audible abdominal noises or rumbling, nausea, and fatigue. Despite the prevalence of the syndrome, the exact cause of IBS still isn’t known. There is also no known cure for IBS, and a vegan diet will not resolve it. IBS-C: Constipation is the most frequent symptom. IBS-D: Diarrhea is the most frequent symptom. 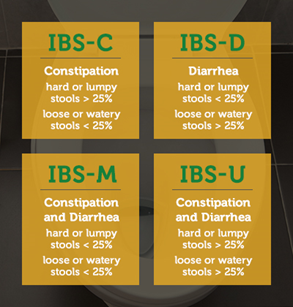 ​IBS-M or IBS-A: Both constipation and diarrhea are experienced alternately. IBS-U: Symptoms follow an irregular pattern.